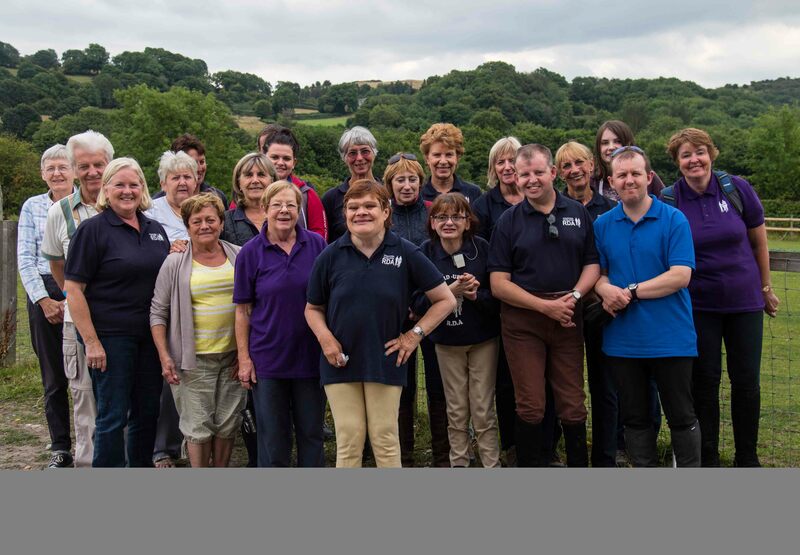 Lots of tired and happy faces returned from a fabulous holiday at the Clwyd Special Riding Centre in Llanfyndd, Wales. What a lovely time we had! We arrived on Thursday 6th August and immediately started unpacking clothes ready to change for the rider’s assessment on their mounts. Chris was given Carlin, Neil was reunited with Mr Harvey, Jules, who had joined us for her first time, was introduced to Guinness and Jo was given a sweet pony called Apollo, who was going to have to walk quickly to keep up with the bigger boys! After a short ride we put them in their field next door to our bungalow and had a rest before dinner. Karen also went through setting objectives with them all so that they could work towards an Endeavour award. Up with the lark the next morning and our last rider Jo arrived and introduced to Big Charlie. The others meanwhile caught their ponies in from the field. After grooming, tacking and warming up it was off round the tracks for our first ride. Karen had been up early and put coloured pieces of ribbon which we had to collect. Neil must have been alert as he collected 7! Some of the others must have been dreaming of things to come! The weather was glorious so after a break at lunchtime we were off again, this time collecting wild flowers. The water splash was tackled by all except Jules as Guinness does not like getting his hooves wet apparently – what a wally! After tea, tack cleaning duties were on the cards. Jules had set learning how to do this as one of her objectives so was almost first there whilst Jo P took it slowly as its not her favourite job! Saturday came and our warm-up was to place items of food into buckets of what horses do and do not eat. This was scuppered a bit by Mr Harvey who took a shine to a lemon! Our first ride outdoors took us a long way down the disused railway track with one of the girls from the stables. We were pleased to have shade and only one hill as it was a little warm. However, after lunch we were off again up and down the hilly tracks after practicing figures of eight and stopping in between poles whilst riding in pairs. Timing being crucial so that you stop at the same time in the middle! Jules and Neil gained 10/10 taking online quizzes on parts of tack and colours and markings of ponies. Well done both! Then it was down to the Cross Keys for our dinner, a lovely rest for our parent caterers, Sandra and her team and a very warm welcome from the landlord and locals. We were very lucky with the weather as Sunday continued to be warm and dry. Jo, Chris and Neil were all confident enough to ride around the tracks independently and, with Jules, took turns in which way we should go. We had a lovely picnic break on the top of the hill overlooking the stables trying to eat all the cake that had been brought, but we were losing the battle!! Later we practiced trotting in the outdoor school. Chris, Jo and Neil accomplishing this without helpers and Jules tried so hard to get the rhythm to rise. Jo P enjoyed her short jogs and was very pleased to be given reins instead of her ‘bunny ears’ because she had ridden well around the tracks up and down the hills which was one of her objectives tackled. Bit high up for Jo! Monday came and there were a few sad faces as this was to be our last ride out before we said goodbye to our horses. The helpers however, were looking forward to going around the tracks to walk off the amazing roast beef dinner followed by bread and butter pudding the night before!! After putting the horses back in their field and giving them their last pat the riders were given a surprise. Alys, an instructor with CSRC came into the indoor school with Big Charlie and what was on his back – no saddle – big handles? Our riders were given a ‘Vaulting Taster’. First they had to time and walk to pat Charlie, then each one was given a turn sitting on his back and performing various gymnastic moves whilst Charlie walked in a 20m circle. They rode sideways, round the world, lying down, hands out to the side and backwards and Chris and Jo even managed to kneel up. Jules was so excited as she had also had a turn a while back at our stables so she was chosen to go first to show everyone how it is done. Neil could not contain his enjoyment and had everyone laughing with him. What a lovely way to end our holiday. After lunch Karen gave our amazing riders their Endeavour awards. Each one had obtained their objectives, Neil of leading his horse in from the field and trotting independently, Chris for riding without stirrups and trotting independently, Jo P for showing a good position up and down the hills and for gaining reins, Jules for learning how to clean tack and attempting the rising trot and Jo W for having the courage to get on Big Charlie! They also were given another one for having a go at equestrian vaulting, which takes a lot of courage on Big Charlie! Final rosettes were given to Dennis for being a superb ‘washerupper’ and Roger for being the ‘Most Improved Helper/sidewalker’! A huge thank you was given to Sandra and her catering team and all to our instructors and helpers and then we packed the cars for the homeward journey. . We can’t wait for next year! On a more serious note, the quotes below sum up what RDA achieves. Its not just the social element….. Previous post: Amazing results at the RDA National Championships and another NATIONAL CHAMPION!